After 2 weeks of bearing with the hazy conditions on the island and the pent-up energy from the lack of mileage, it was no wonder that there was a good turnout for our final training run before we depart for GCAM in a few days. 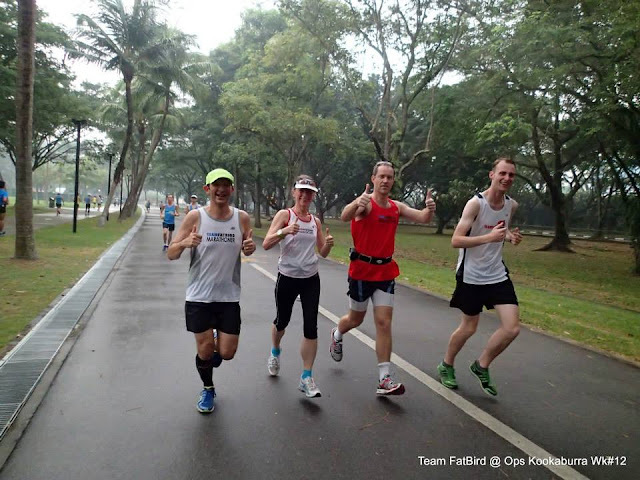 The weather looked threatening in the morning with lightning flashes and cloudy skies, but it turned out well enough for the Kookaburras to start our race-pace tapering run. 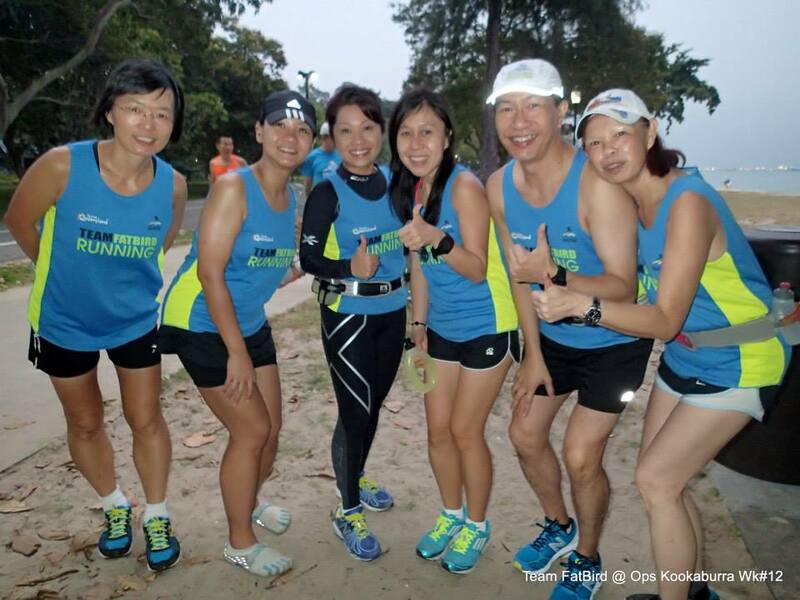 Many were decked out in their Kookaburra race singlets and race day gear for a final test-drive before packing them off for the big international marathon. 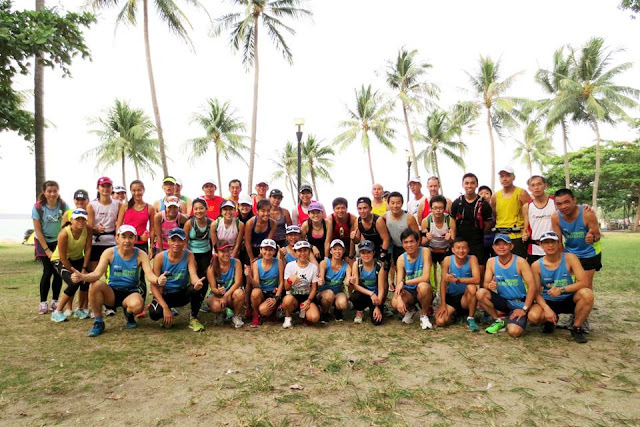 As the trainees took to the East Coast pathway highly charged, most were wearing happy and confident smiles, with the knowledge that they have put in their best effort for the whole training journey and are now in good form to do a solid race in Gold Coast. 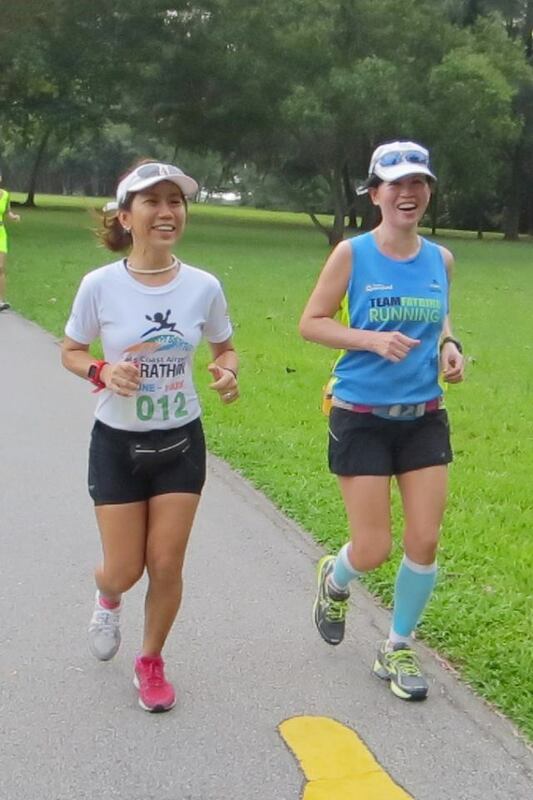 There was a light drizzle along the way, and coupled with light, cool winds, the weather was just perfect for a ‘feel’ of what we might expect on actual race day, albeit with a lot less humidity. 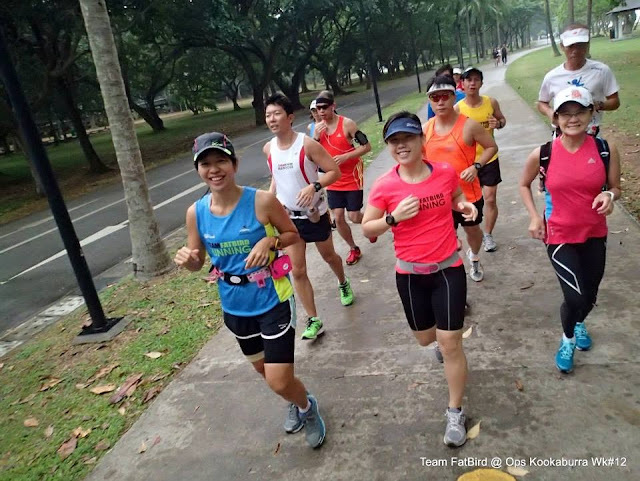 It was nice to bump into many other running groups out training for upcoming races like the Bay Run/AHM or just simply having fun after the ‘moody’ patch with the haze in the past weeks. 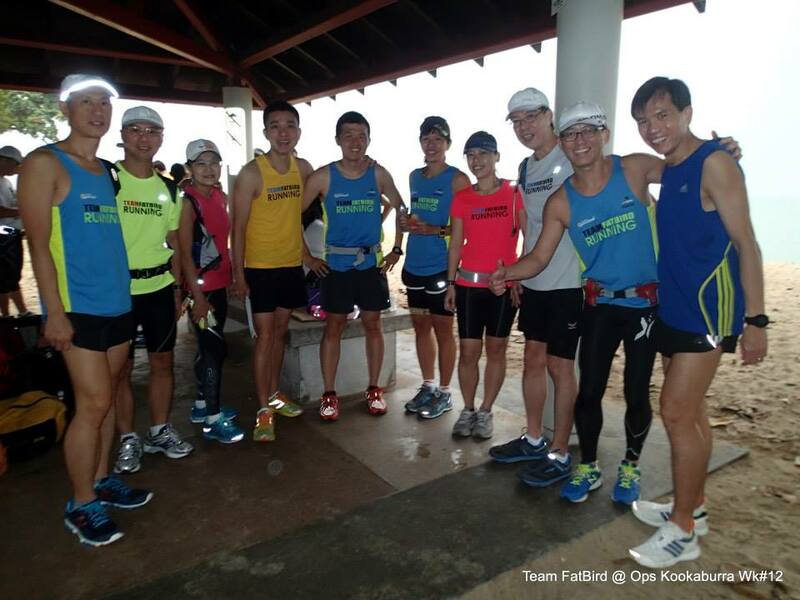 All had a good 2 hour run in cool weather and cloudy skies, with just a couple of us getting caught in heavier rainfall at the tail end. There was a quick debrief followed by lots of chatting and sharing among the Kookaburras, all getting excited for the GCAM trip. 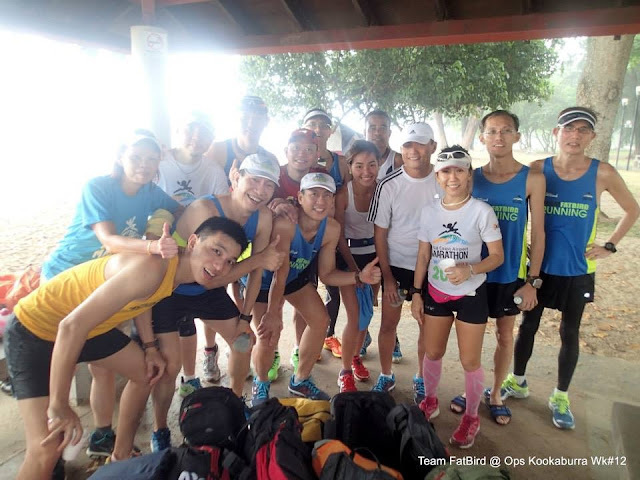 The enthusiasm even rubbed off on those who are not going down under this year, but have pledged to go for GCAM 2014 after feeling the positive and encouraging vibes from the Kookaburras. 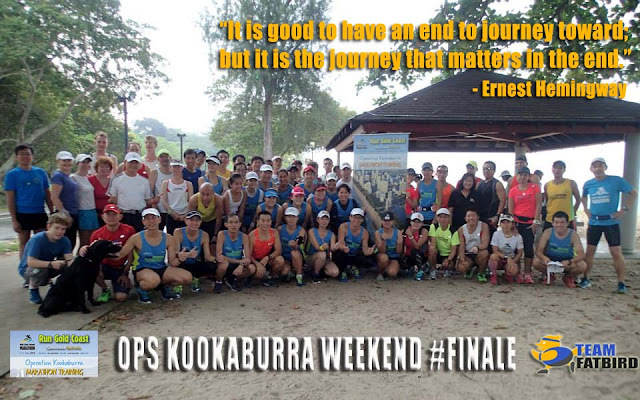 As we wrap up a successful 12-week Ops Kookaburra program, we wish all Kookaburras and Team Singapore a good race and fun-filled trip to Gold Coast. 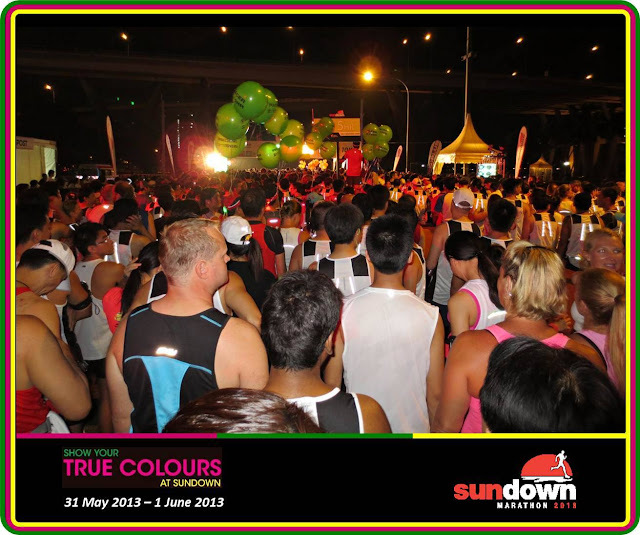 Importantly, remember to enjoy the journey and Go For The Run, Stay For The Fun! 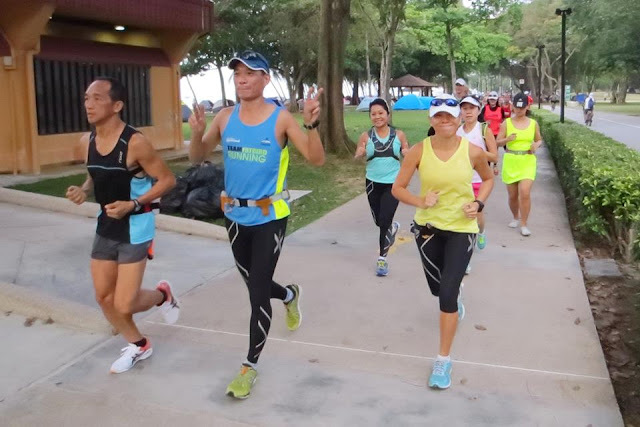 After the 2-week break from participating at the Sundown Marathon, the Kookaburras were glad to be back for our final long run before tapering for the Gold Coast Airport Marathon (GCAM) on 6-7 July. 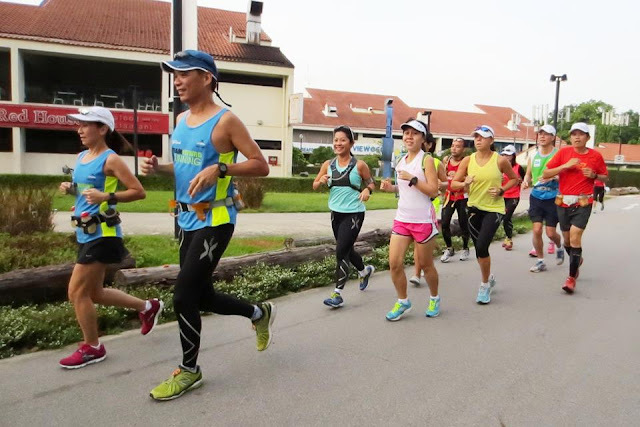 It was quite a decent turnout considering that there were a couple of other short races happening in Singapore and across the Causeway. 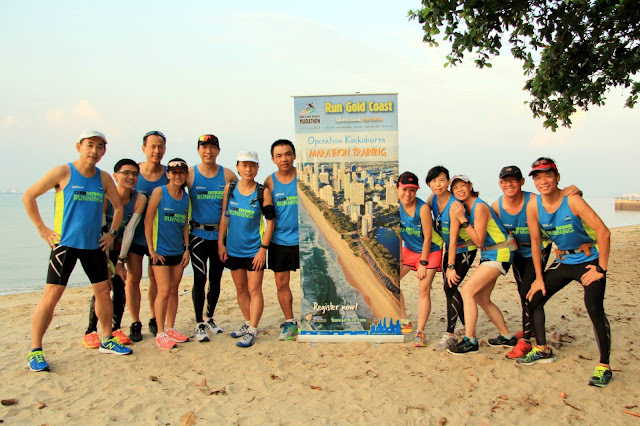 The Kookaburras were also happy to collect their training singlet tops to do trial and testing of gear and equipment they would be using down under. 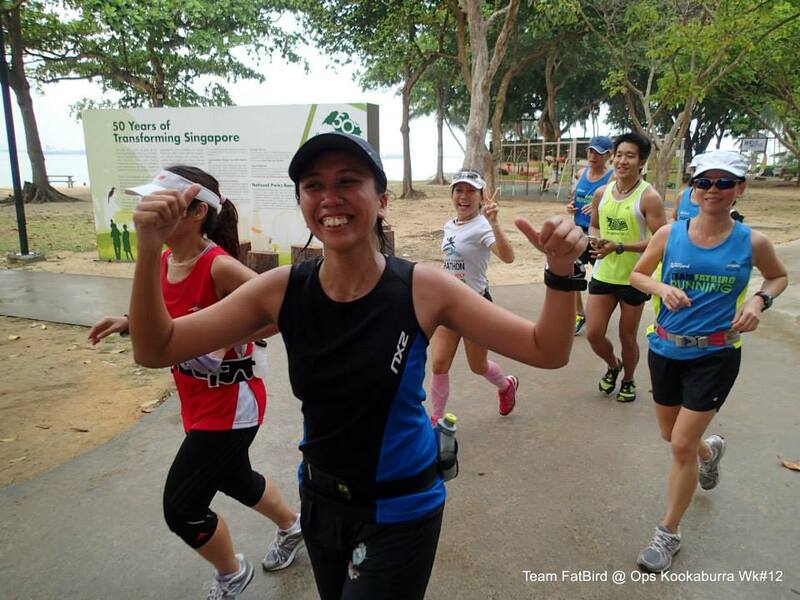 This being Week 10 of the 12-Week program, we are already into Optimal Pace training – out to push the paces to see where we stand in terms of speed endurance for the long distance. 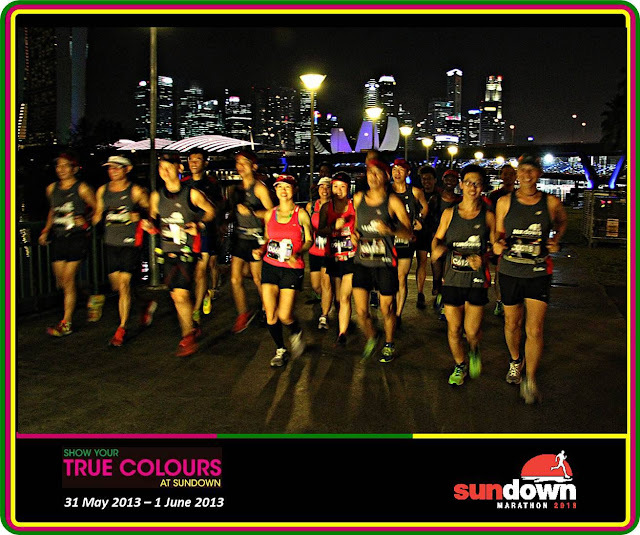 The majority of us being in the Full Marathon category, the target distance for the morning was 32km at sustained race pace, a challenge that would not be for the faint heart-ed. 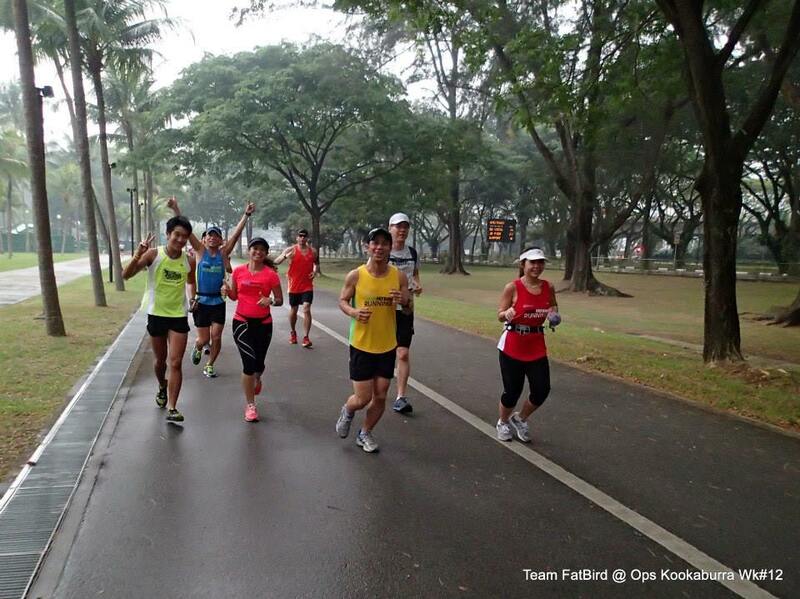 Fortunately for us, the morning was rather cool and a tad windy, albeit with a slight haze from the Sumatra fires. 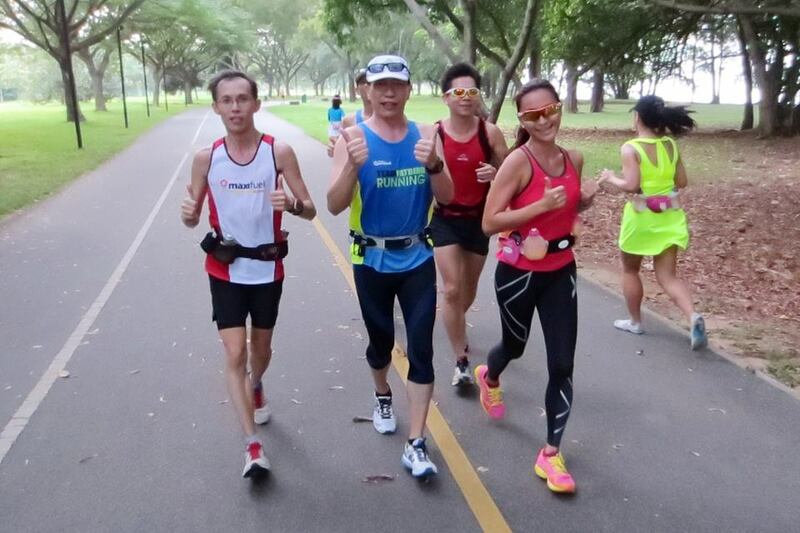 We made use of the nice weather to push a faster pace for the first 10km, extending to 14km and then 21km. 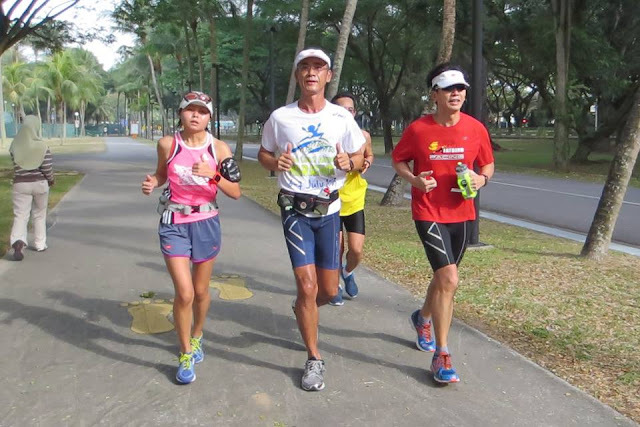 The route along ECP was convenient as there were ample public water stops; and passing Checkpoint C4 allowed for quick isotonic drinks stops for the respective pace groups. 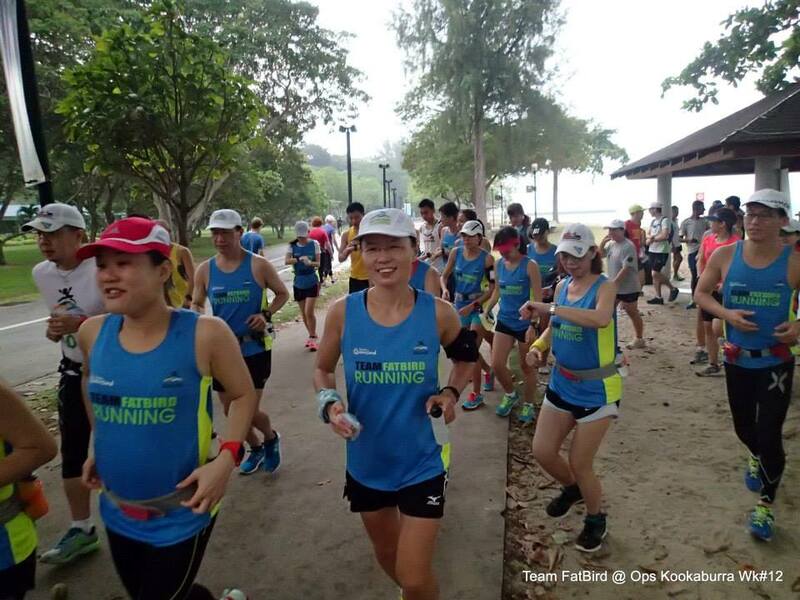 The first 21km was covered at better than Optimal Pace for many of the Kookaburras, giving us the confidence that we would be able to push the pace in the much cooler temperatures of Gold Coast. Most of us have recovered sufficiently from Sundown to be able to run hard, although some effects of the Night Marathon could still be felt. A few who have had earlier training runs/races on Saturday decided to just stop at 21km, happy with their ability to keep to target race pace for at least half of the full race distance. The second loop of 9-11km to complete training requirements was one that tested the mental resolve and strength of the Kookaburras to sustain pace with their already tired legs and heavier cardio cycles. 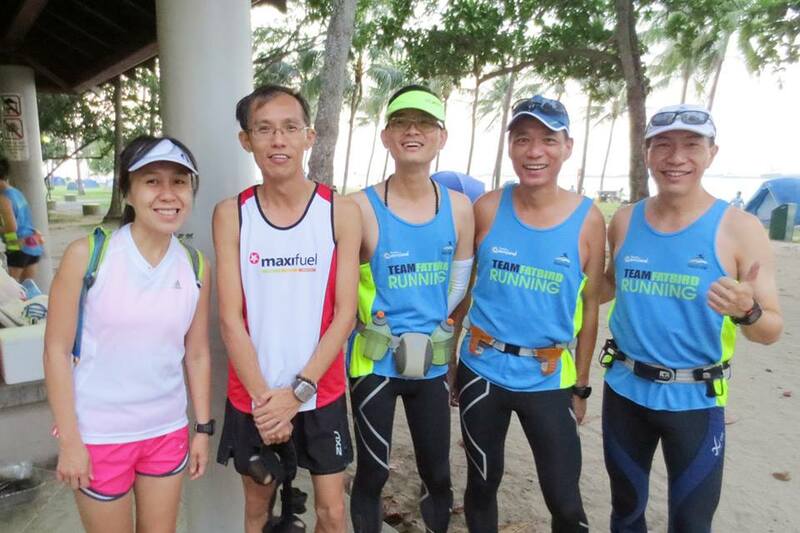 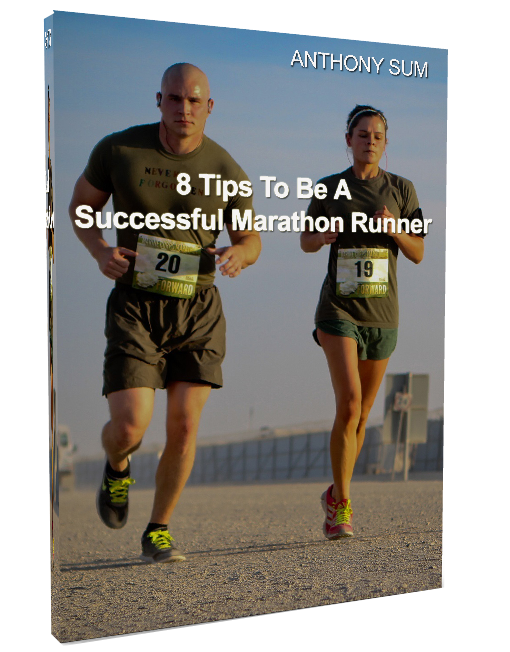 With their experiences gained from past marathons and group training workouts, most managed to find a “second wind” to push on and eventually completed the challenge. The lessons and experiences learnt from all these long runs in areas of speed endurance, pace sustenance, hydration and nutrition plans,knowing our bodies and capabilities, including race strategies would be useful in getting us the desired results at GCAM. 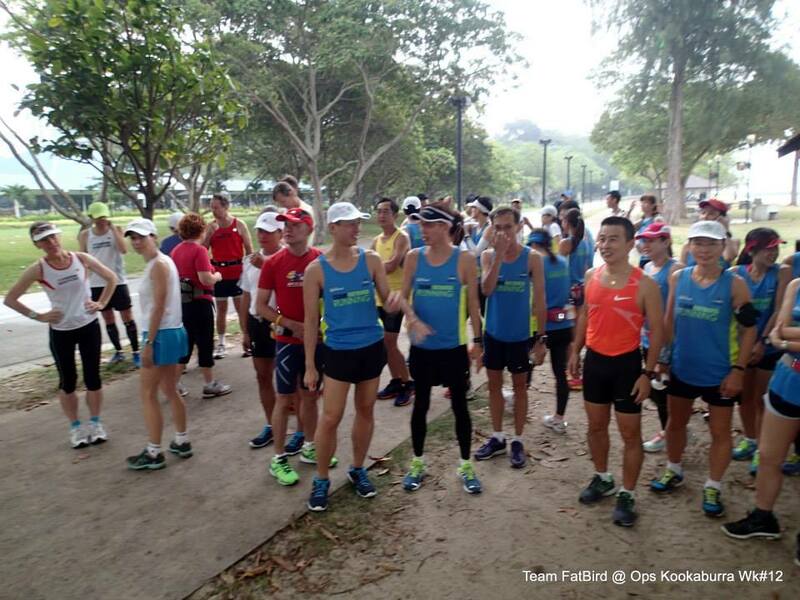 With barely 3 weeks to race day, the Kookaburras will be tapering and making adaptations from all the weeks of long runs to build up a good form. 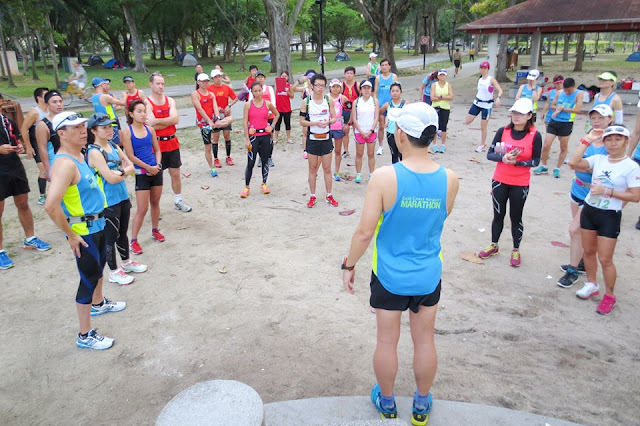 There will be a pre-departure briefing for all GCAM-bound participants which will be useful for the many whom are going there for the first time. 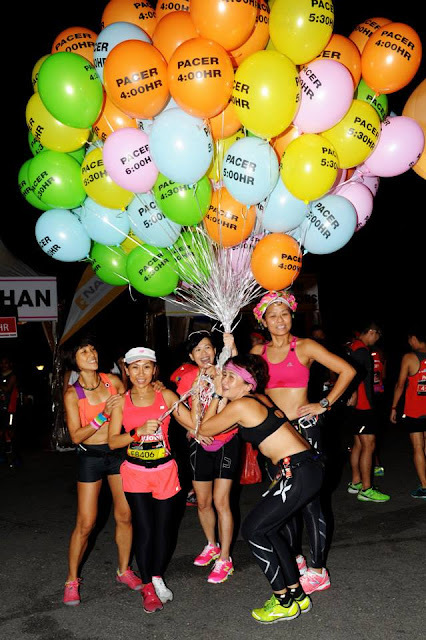 We are also going as a rather large contingent, making this trip and race one that many of us are looking forward with anticipation in terms of both the run and the fun we will share. There is one final group training run before we set off for Gold Coast; one that we will officially be passed out as Operationally-Ready Kookaburras, donning our blue/yellow Kookaburra singlets with pride. Team FatBird is pleased to bring back this highly successful and popular and training program of speed, track, hills, trails – Operation Kingfisher 2013 , 6-week PowerFLIGHTTM Half-Marathon training program (12-sessions of track, hills, tempo and pace runs) to prepare runners for The Singapore Bay Run & Army Half Marathon 2013.
to reserve your Training Slot! Running The Bay? Let FatBirds Show You The Way! 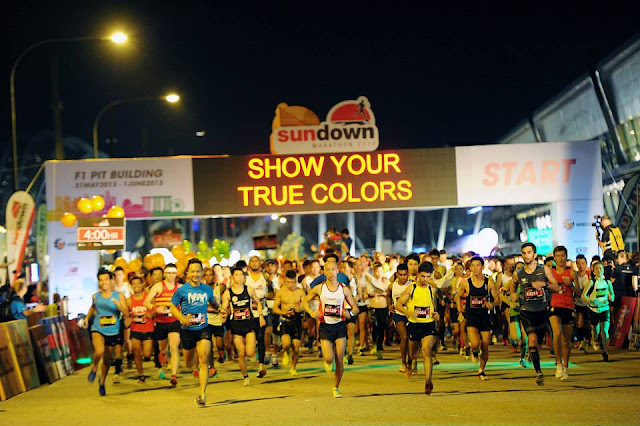 This year’s Sundown Marathon took on an interesting format with the event conducted in 2 nights, the first (Fri) night for the HM and 10km runners and the second (Sat) night for the Full Marathoners. 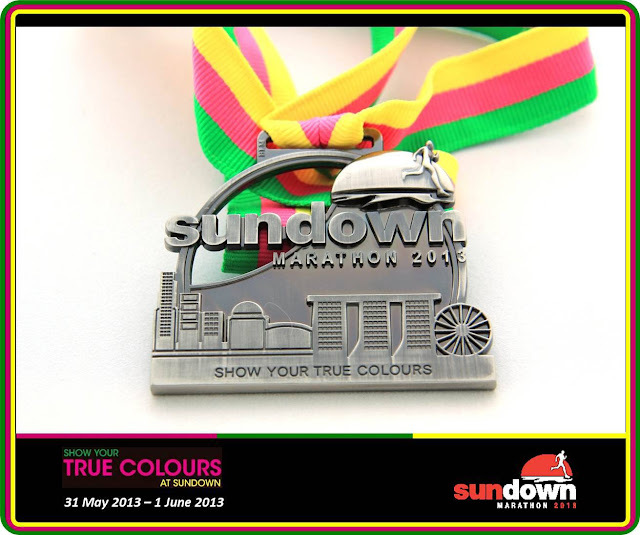 Themed “Show Your True Colours”, the event focused on bringing out the best from the 30,000 runners in a bid to show their best colours both in terms of run as well as in the apparel and shoes they would don for the event. 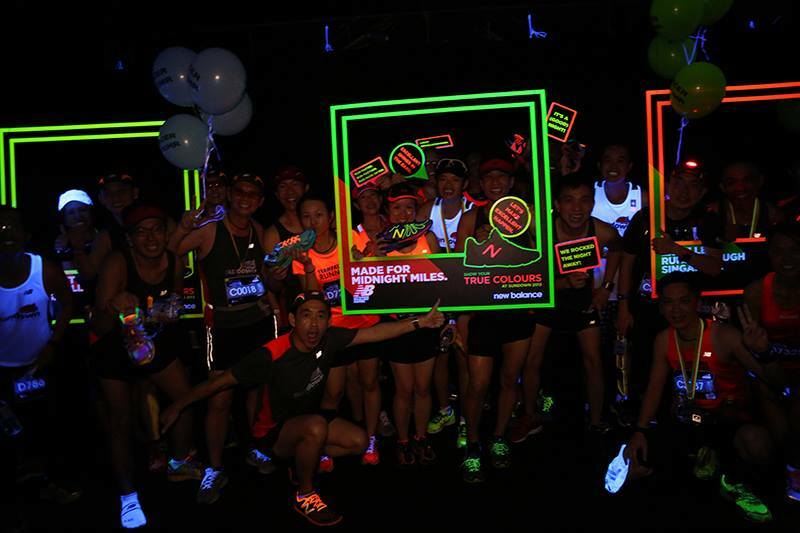 With hot Zumba dances pre-race, glow photo-booth from NB, psychedelic lighting from Nathan, recovery milk shakes and iced-cold dips from Maxinutrition among others, there was a good turnout from the Sponsors and Partners. 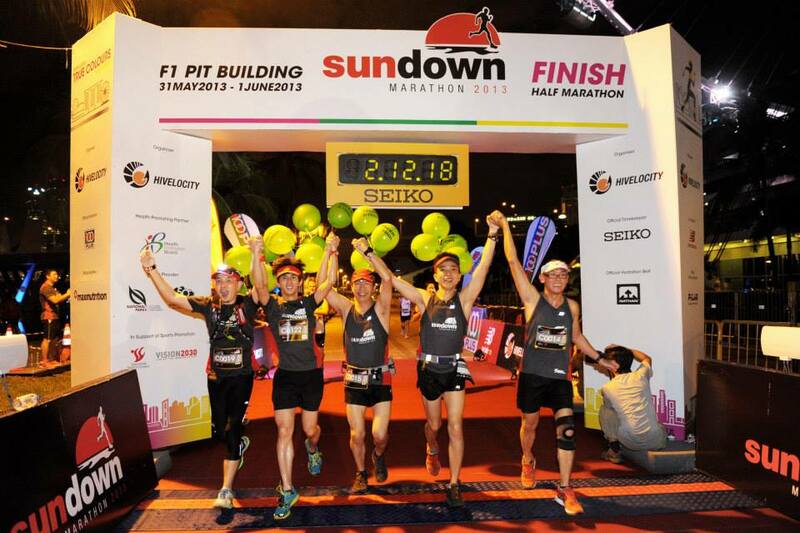 With the start/end at F1 Pit Building, it was a lot more accessible and comfortable, with many runners checking in earlier and leaving later, finding the time to hang around to soak in the race atmosphere. 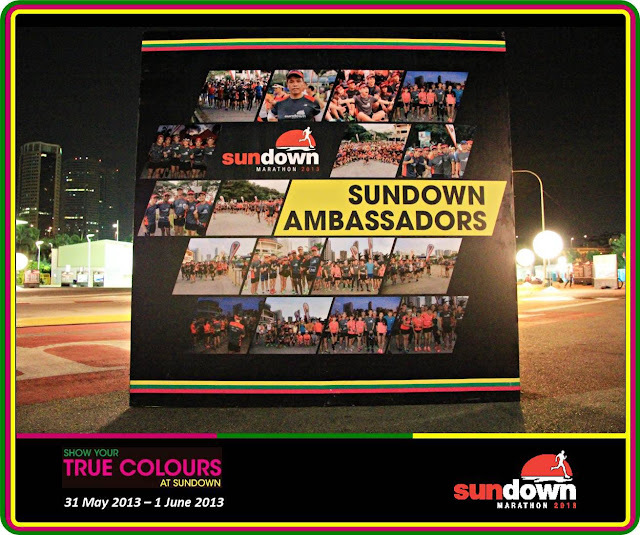 The Sundown Ambassadors (Pacers) this year had to put in an extra dosage of commitment and effort in tackling the 2-night event, undergoing a 15-week of grueling training after a stringent selection process which saw more than 100 applicants. 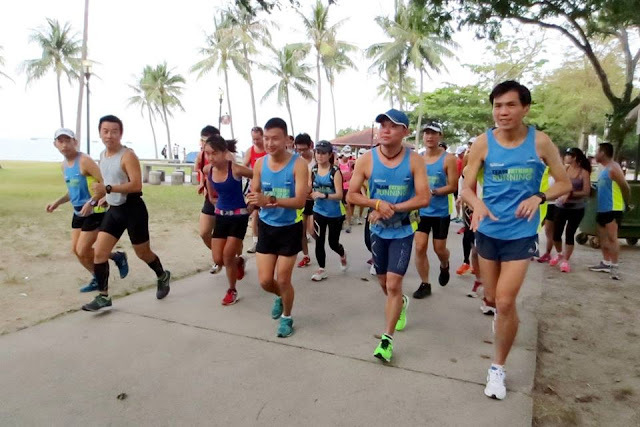 The final 50 members after the 15-week journey attest to the quality of the team that remained to deliver a sterling set of results over the 2 nights of HM and FM pace missions. The 120 Operation NightHawk trainees who underwent a 12-week structured training program covering both night and day long run missions saw themselves performing at peak to bring back many PBs and great timings in spite of the challenges they faced in Night Running. 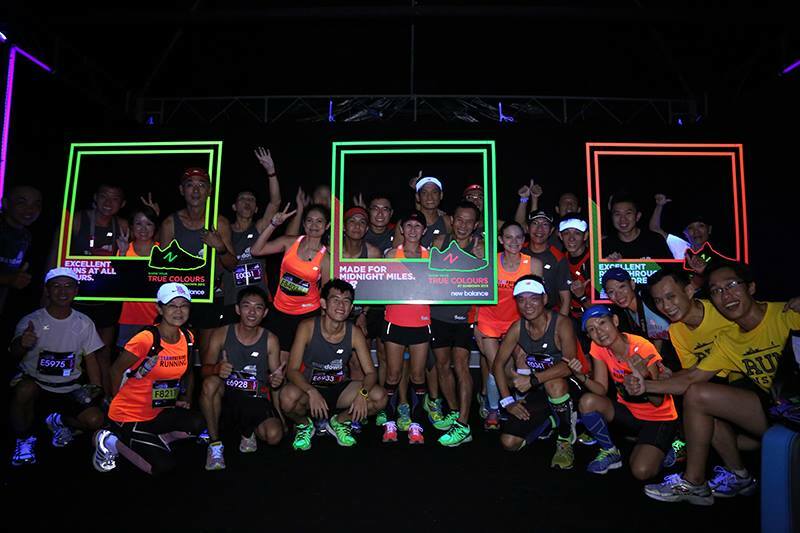 On Friday Night, the Half Marathon Pacers and runners were the first to be put to the test. 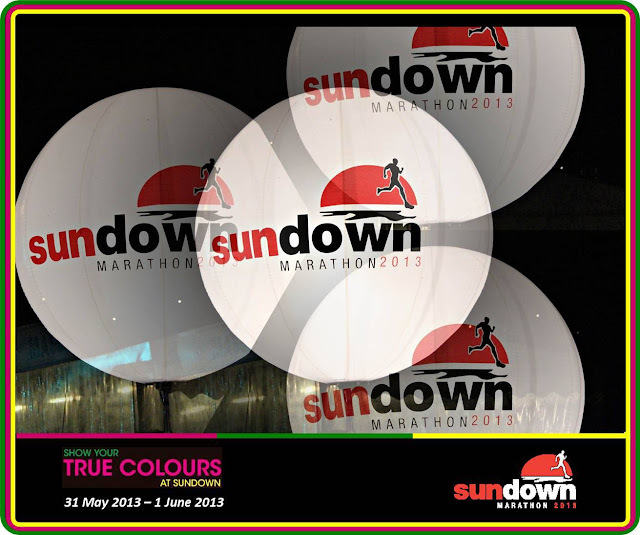 Very close to the start line was the Sundown Ambassadors Tent where the Sundown Pacers were to prepare their battle gear with colorful balloon groups for pace identification. Dressed smartly in their Sundown Pacer race kit, the team was ushered into the starting pens at 10:30pm to form up in their respective pace groups. There was a rousing welcome from the race volunteers and MC, thanking the Pacers for what they would be doing – pace and lead runners to their race target timings. 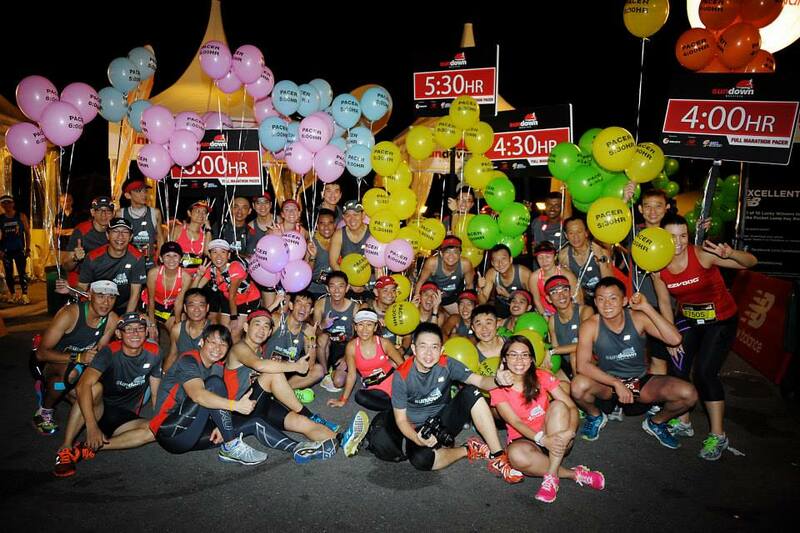 The NightHawk HMs and supporters had gathered at the Ambassadors tent for group photos and final well wishes before race start. 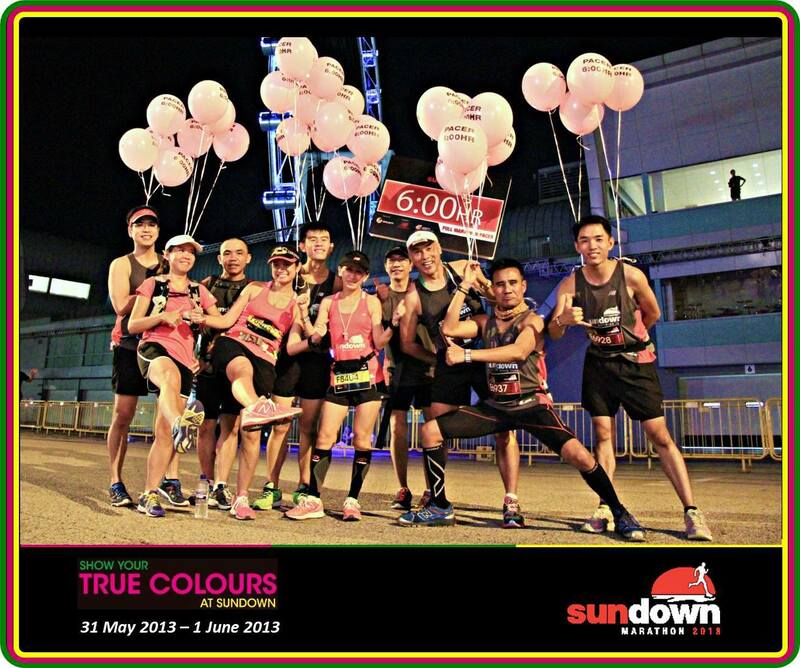 They went on to join the Pacers in the starting pens at 10:50pm. 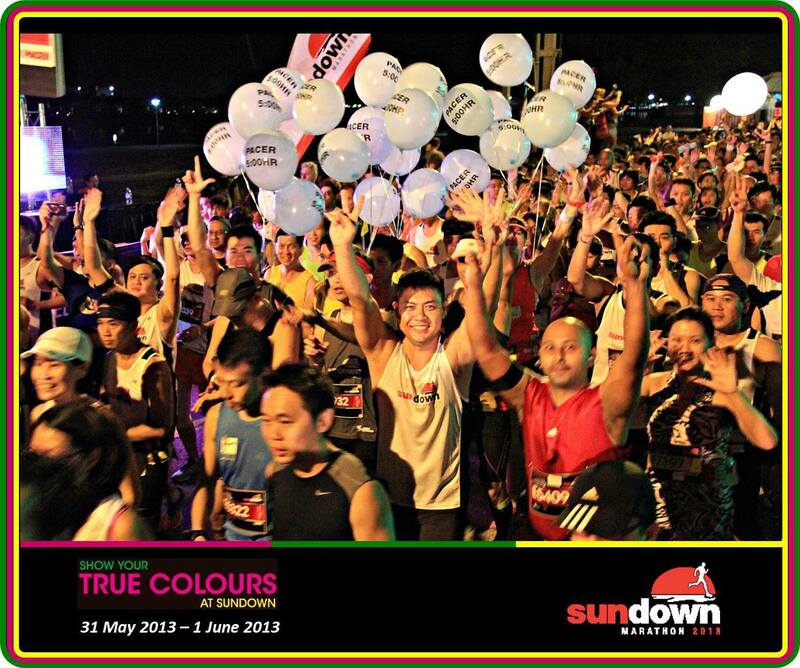 After warm-ups and pumped up music, the race was flagged off in colourful fanfare. 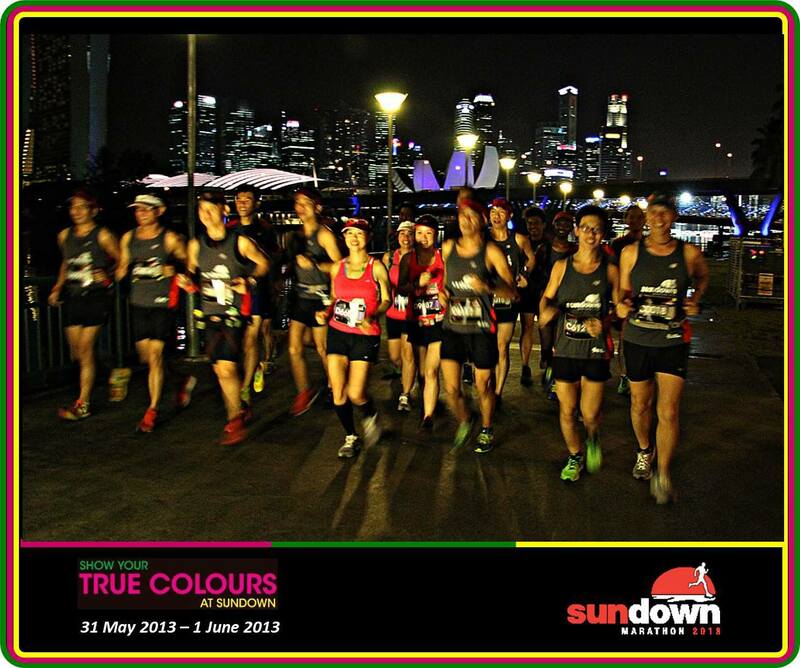 The NightHawk runners did very well, with the best coming in at 1:36min and many doing sub 2:00h, 2:15h and 2:30h. The Pacers delivered well on their pace mission, bringing many runners across the finish line with a few min to spare using their Optimal Pace strategy. 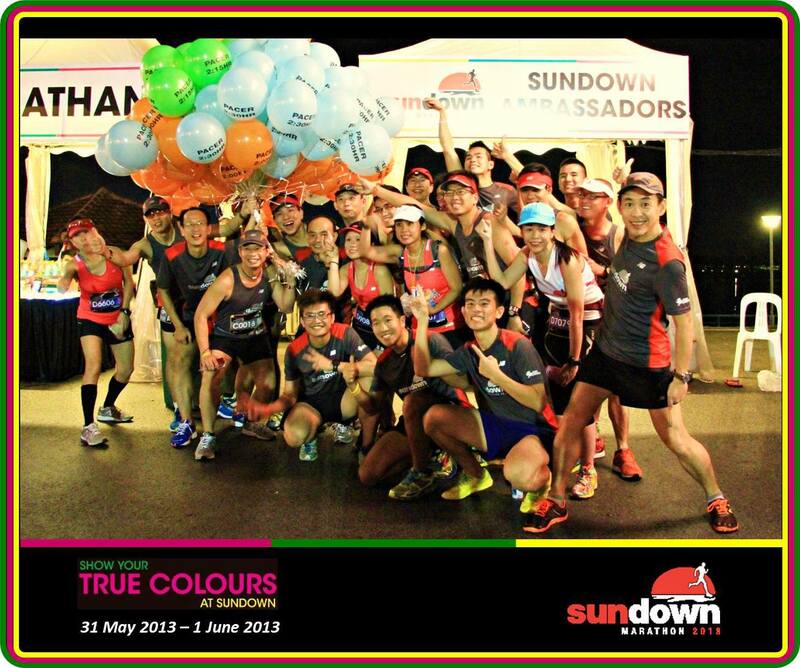 Lots of congratulations for the Pacers for a job well done. On Saturday night, it was the turn of the Full Marathon pacers and runners to show their mettle. There were many more runners gathered at the Ambassadors Tent as there were more marathoners going for pacing in the 4:00, 4:30, 5:00, 5:30 and 6:00 timing groups. 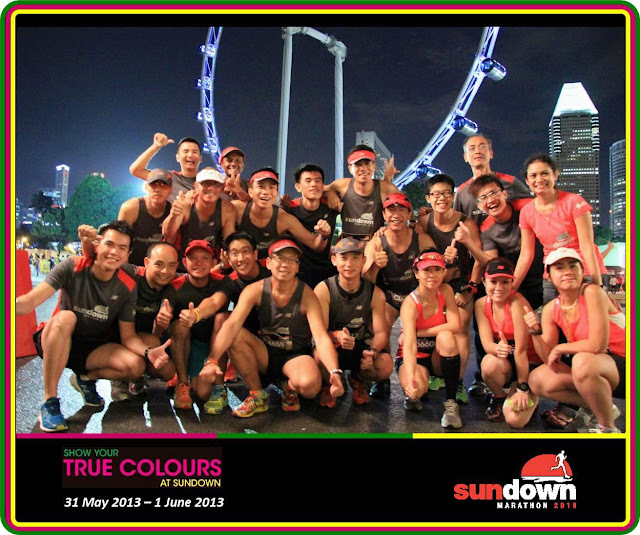 Lots of group photos were taken, and like the HM group in the previous night, the FM Pacers took their positions in the start pens with yet another warm welcome and thanks from the MC and Sundown Organizer. 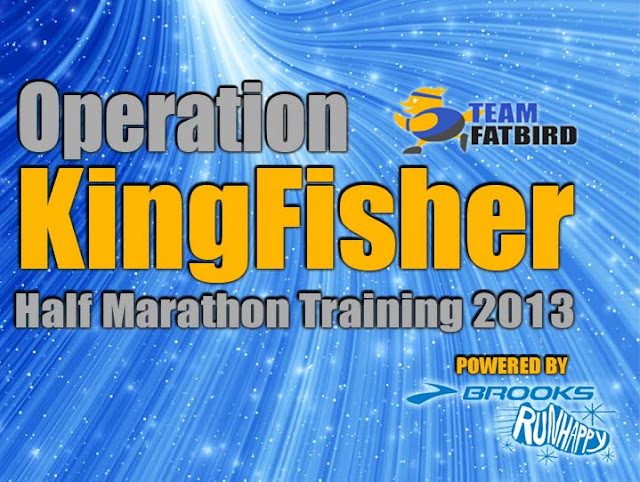 After the runners joined in the pens, there was a moment of silence for the Boston Marathon bombing victims before the race started – just 5min before, it was the start of the inaugural handcycling marathon race. 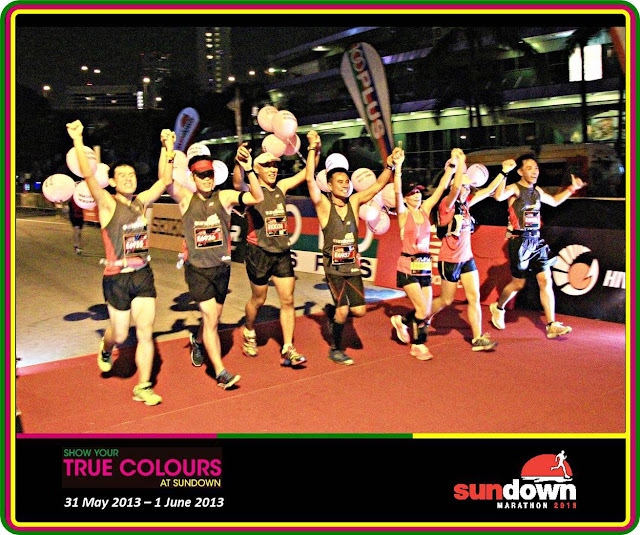 Because of the distance, the challenge to maintain and sustain an Optimal Pace for the Full Marathon was great. Our Sundown Pacers spent 15 weeks preparing for this important mission which they would deliver as a team. 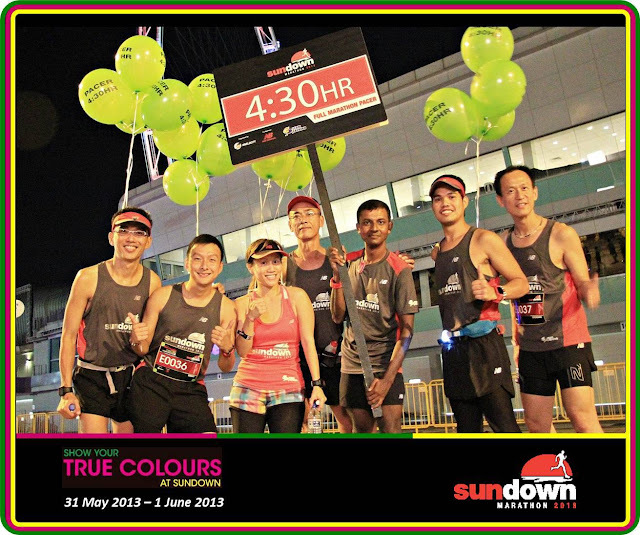 4 hrs after race start, the 4:00h Pace Group crossed the line (in 3:59-4:01) with many runners in front finishing below the desirable 4:00h marathon mark. The rest of the Pace Groups did extremely well to maintain Optimal Pace to finish their respective pace timings, mostly on the dot. 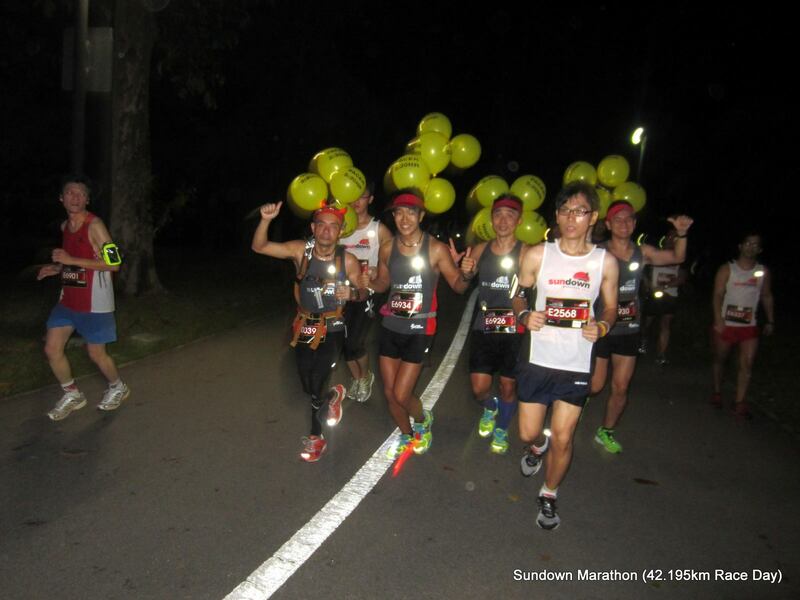 Many NightHawks scored their Personal Bests and achieved very good results (the best in 3:23h), all in spite of the mentally challenging route and the rather humid night conditions. 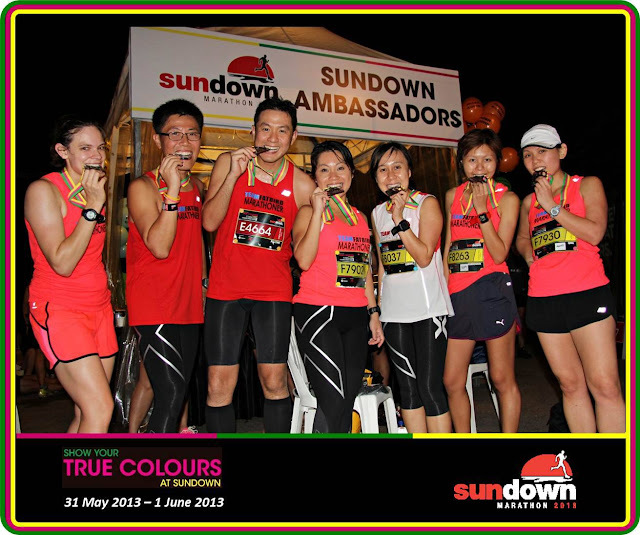 Congratulatory handshakes went round at the Ambassadors’ Tent, many proudly donning their finisher tee and medals for photo memories. 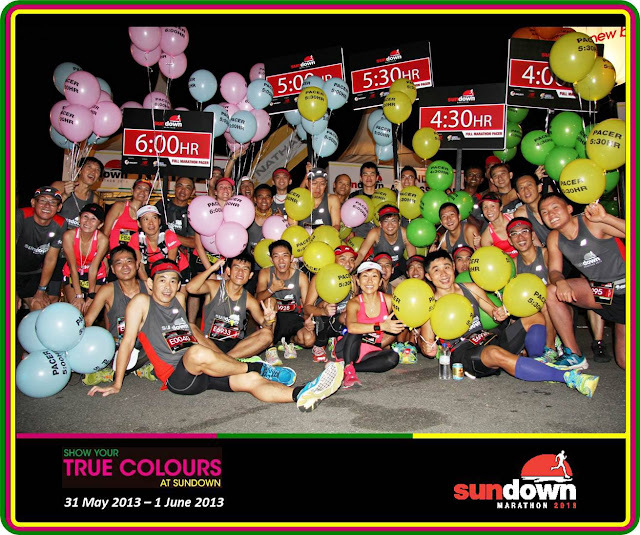 Sharing of the race euphoria, trials and tribulations went into the wee hours of the morning, and by 6:30am, most of our runners were back with their accomplishments. 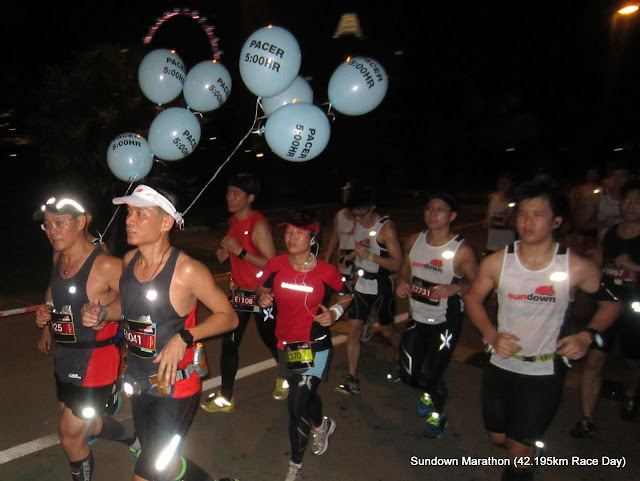 It was a long night with many weary runners completing what many termed was a ‘not so easy’ marathon – many making resolutions to return to better their performances (probably with even more structured training and lead up runs). 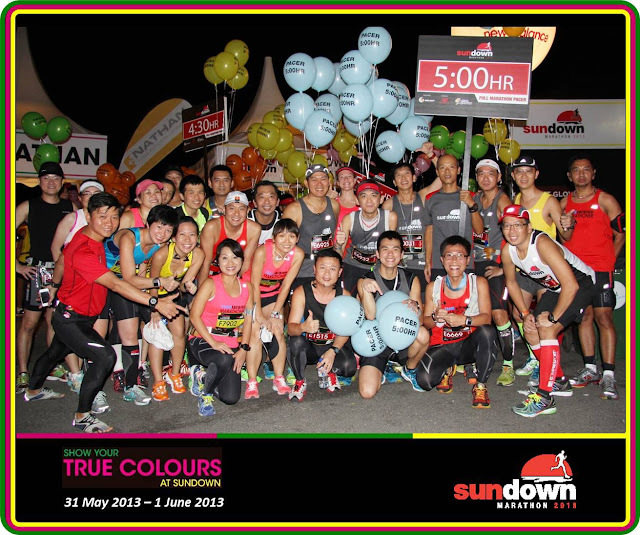 The sense of satisfaction and fond memories of this special night race will remain with all participants for a long time. 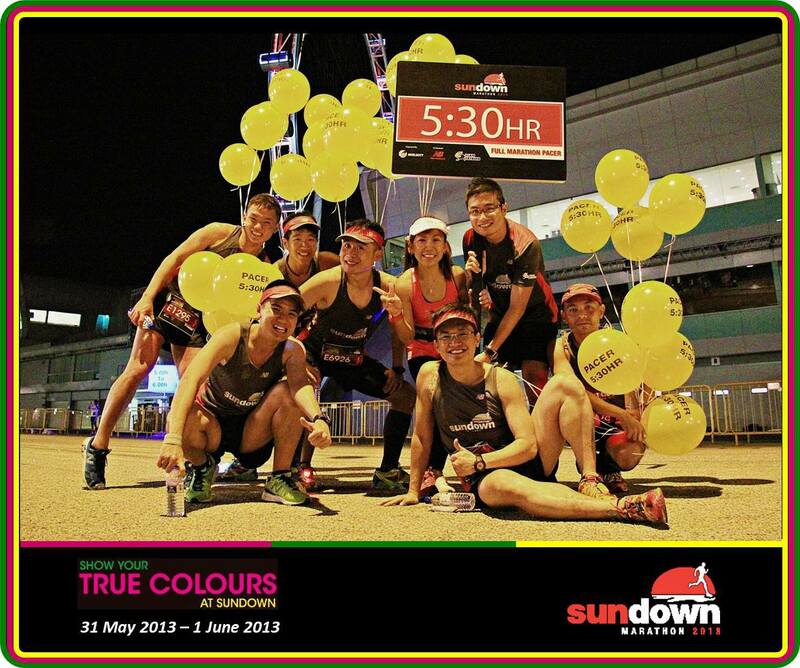 A huge shout out to the Sundown Pacers & Ambassadors for the outstanding Pace missions at the 2-night Sundown Marathon – the timings were delivered to a ‘T’ and more importantly, the teamwork and camaraderie shone through among all the Pace Groups, extending to the entire Pace Team. 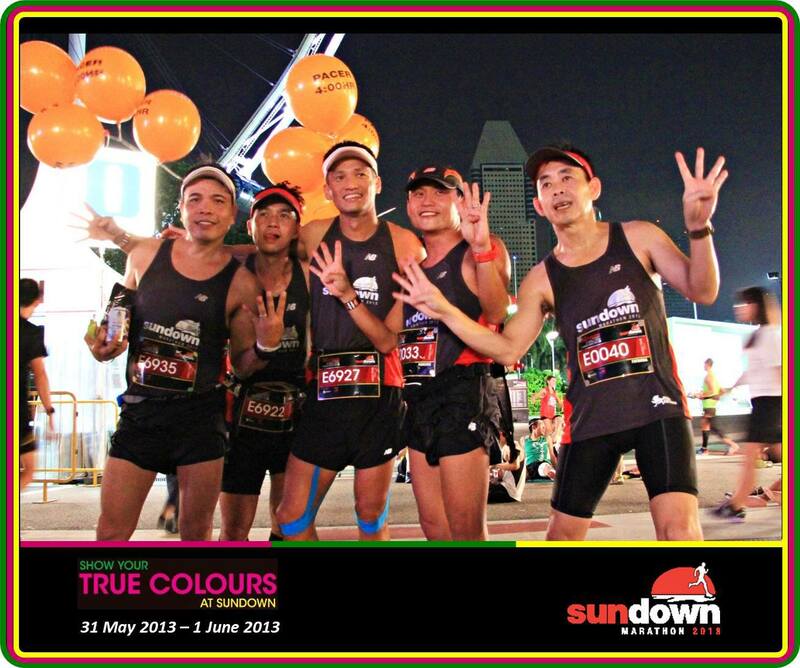 Congratulations for a sterling performance and we hope that the experience gained from Pacing is so special that memories and feelings of pride and satisfaction of a job well done will remain with us for a long time. 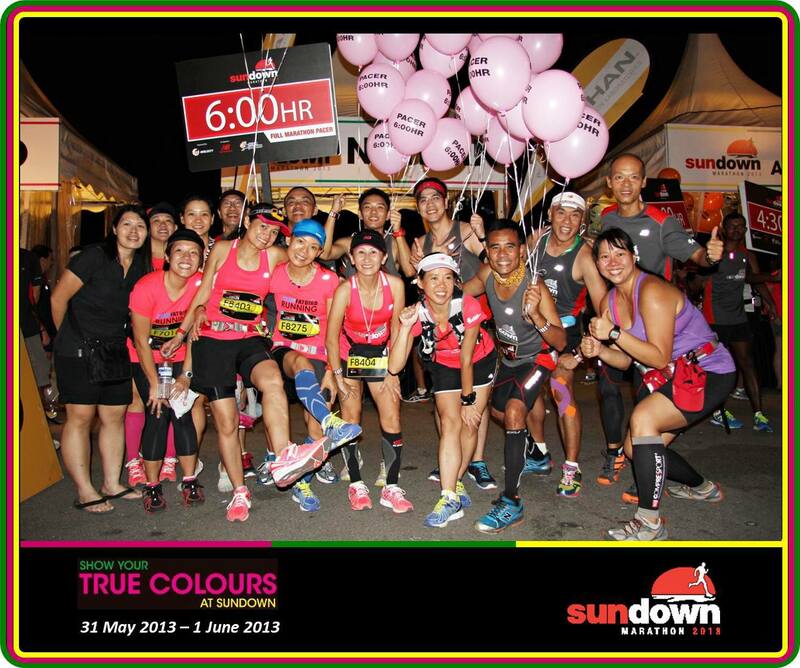 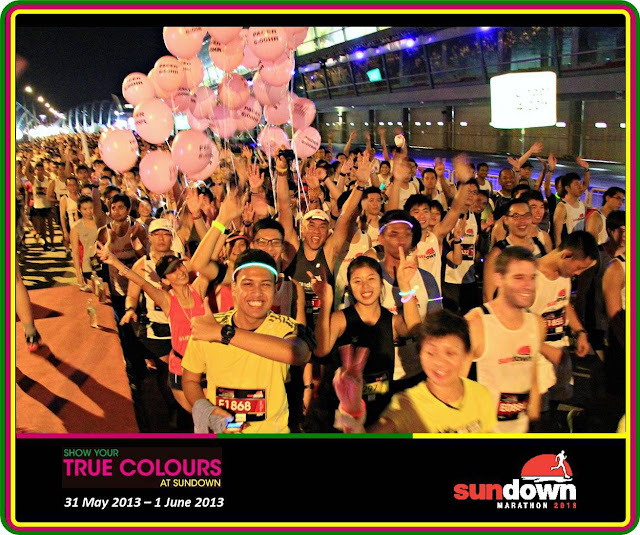 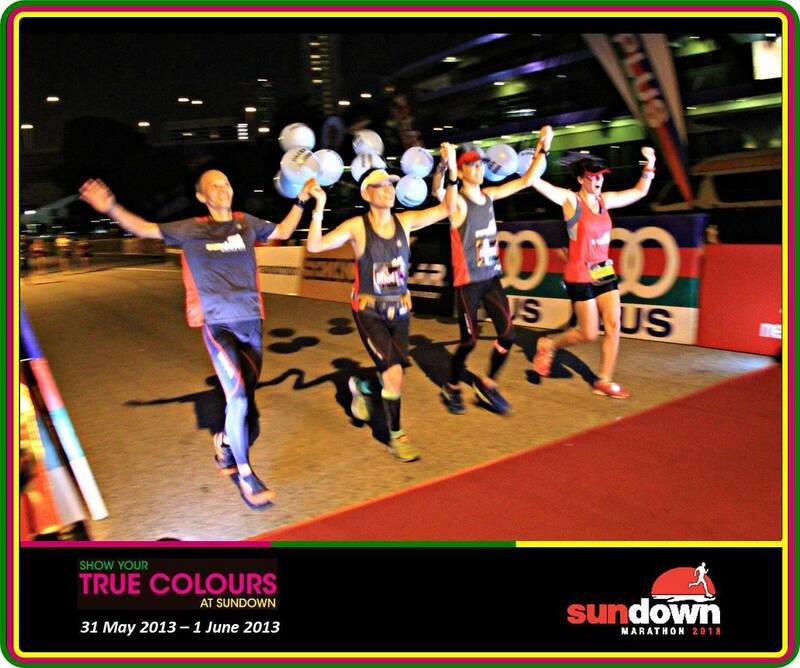 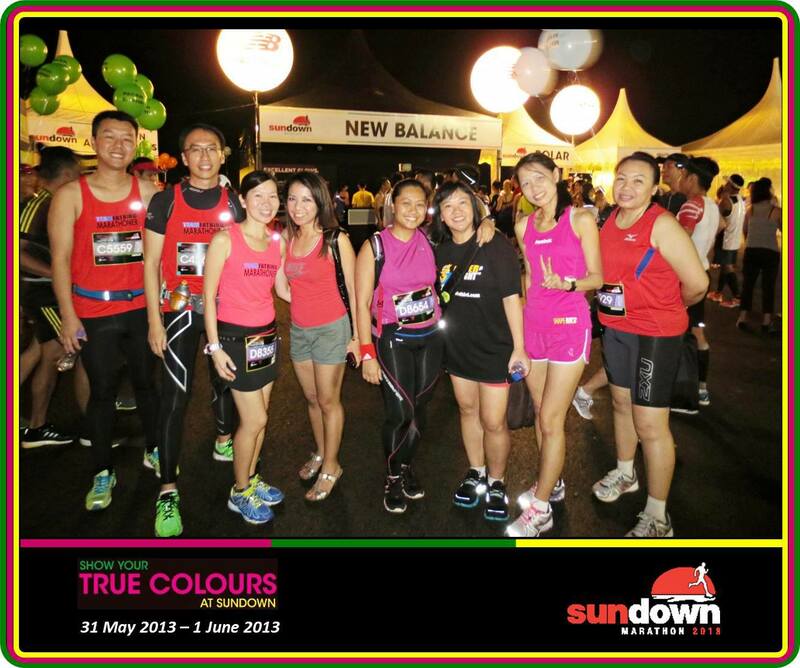 Heartiest congratulations extend to all NightHawks & FatBird Runners for your outstanding performance at the 2-Night Sundown Marathon 2013. 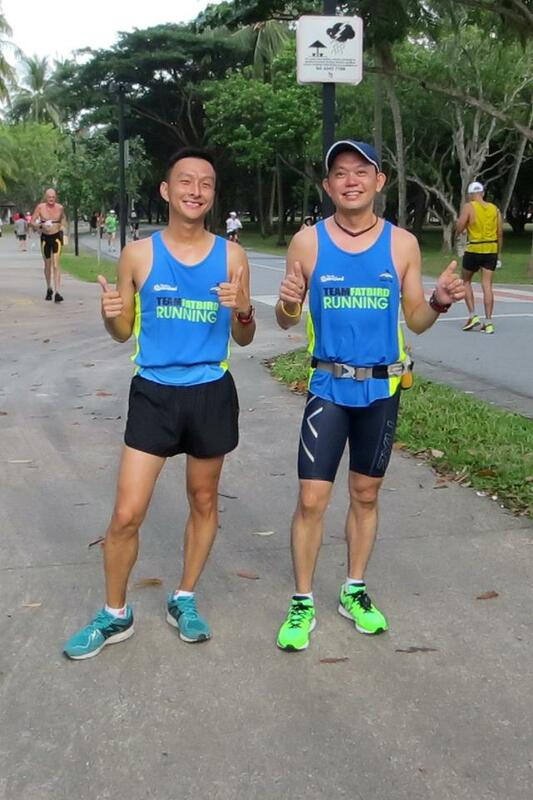 While we heard from many that it was challenging and difficult to achieve good results, you NightHawks rose to the occasion to romp home with PBs and great timings. 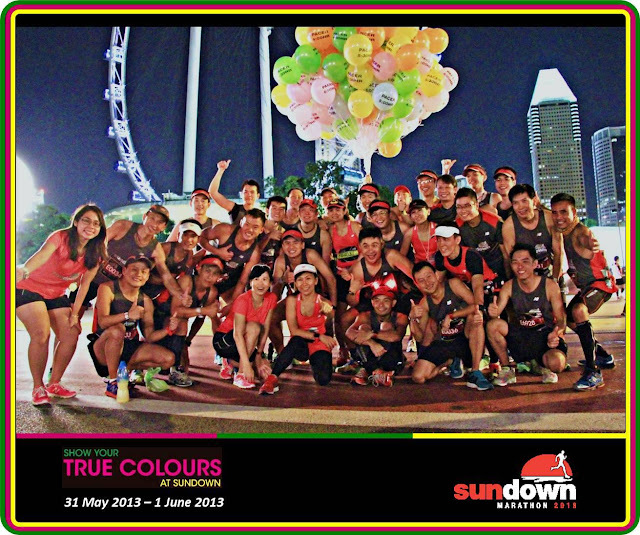 Although some of you were nursing flu-like symptoms and injuries, cramping up, lead-filled feet, your never-say-quit spirit and dedication as seen during the 12-week training brought you through to the finish line convincingly. The few who were sick/injured and had to sit out the race, you made a sensible and commendable decision to come back another day to show your colours – well done! 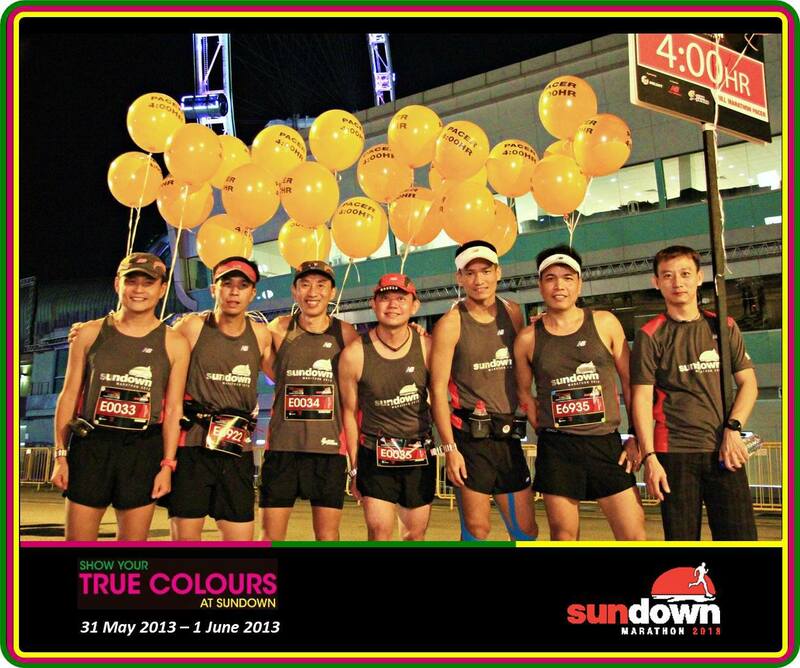 The highly successful Sundown Marathon 2013 was a fitting culmination of our 12-15 weeks of training and pacing together, forging many close bonds and friendships, teamwork and camaraderie among the trainees and the trainers/pacers alike. 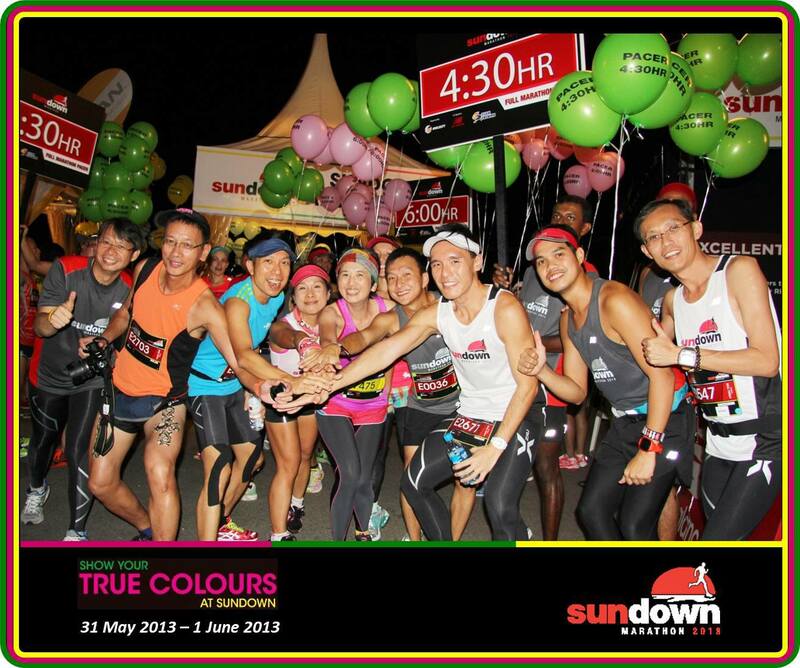 We have grown closer through eat, run and play together – one big NightHawk & FatBird family. 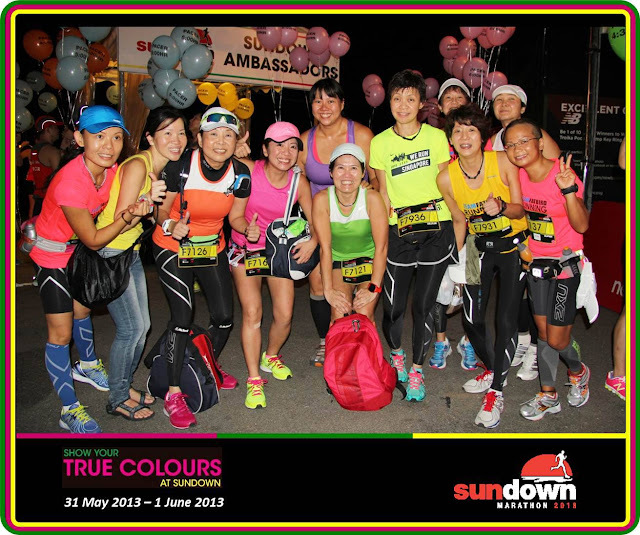 You Have Shown Your True Colours. 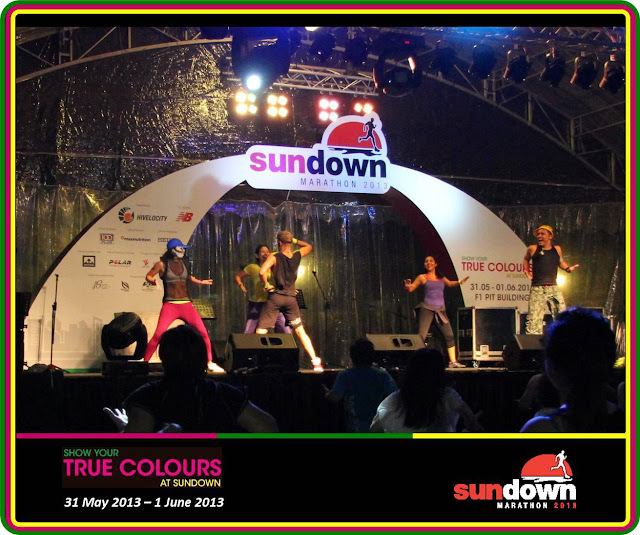 The NightHawks Have Emerged & Rocked Sundown 2013!